The IBM® Cloud Management Console runs as a service hosted in the IBM cloud, freeing organizations from maintaining software to monitor infrastructure. 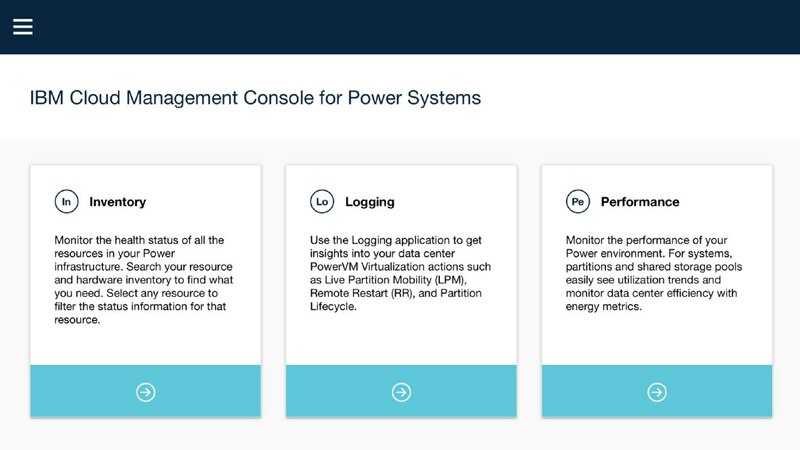 Dynamic views of performance, inventory and logging for your complete Power Systems™ enterprise, whether on premises or off premises, simplifies and unifies information in a single location. This allows clients to easily make more informed decisions. As private and hybrid cloud deployments grow, enterprises need new insight into these environments. Tools that provide consolidated information and analytics can be key enablers to smooth operation of infrastructure. Software as a Service deployment frees personnel from installation and maintenance of software. Information provided about aggregated Power Systems servers include performance, inventory and logging data. “At a glance views” with logical groupings show system health, energy usage and OS metrics. SasS offering provides more flexibility in cost of ownership with pay-as-you-go monthly subscription convenience. Secure cloud-based services accessible from mobile devices, tablets and PCs. Inventory systems including Power Systems, HMCs, LPARs and virtual resources.